Rust-Oleum CombiColor is a primer and topcoat in one for interior and exterior use on bare metal, manually de-rusted metal, surfaces primed with Rust-Oleum 3369/3380 CombiPrimer Anti-Corrosion, or previously painted surfaces. Rust-Oleum CombiColor has excellent opacity (hiding power) and sag resistance leaving no brush or roller strokes and provides good drying properties even at low temperatures. Rust-Oleum CombiColor is a one coat maintenance system for metal, providing superior metal protection, even when applied direct to rust. It remains flexible and does not become brittle or flake with movement. Rust-Oleum CombiColor is intended for brush and roller application and can also be applied by air spray. There are close to 400 different colours available from CombiColor's colour chart available to buy here. Please select the colour/shade when making your order, and if there is a colour you require which is not listed, please contact our customer support team and we will endeavour to match your needs. Rust-Oleum CombiColor contains rust-inhibitive pigments, is lead and chromate free, low odour and VOC compliant. For metal structures in a more aggressive industrial environments, prior application of Rust-Oleum 3369/3380 CombiPrimer Anti-Corrosion is recommended. When applying on Aluminium, Brass, Plastic and other extremely smooth or hard to adhere to surfaces use Rust-Oleum 3302 CombiPrimer Adhesion first. Rust-Oleum CombiColor should be ideal for this application but we would suggest the gates are first primed with Rust-Oleum 3369/3380 CombiPrimer Anti-Corrosion. Products should be ordered online from our website, delivery is nationwide via Fedex. You can view colours available in this product by clicking 'Select a different colour'. Please advise which paint to use on upvc ie primer and top coat. We require ral 7016 matt finnish. Also require ral 7016 matt for aluminium profiles to cover excisting coat which needs refurb. Thank you. On both substrates we would recommend priming with Zinsser Bulls Eye 1-2-3 then finishing with Zinsser AllCoat Exterior Matt (Water Based). Can I get a sample of the colour I am looking to use? The best way to check a colour is to buy a 1 litre of CombiColor in the colour you wish to use and apply it to the substrate in question and allow to dry. However we do have printed colour charts which we can post to you first, but these are only approximate and not provide a true representation of the colour. Hi, can you mix rustoleum to colour match a sample? i need to get some mixed to match against a car i am painting but need a good colour match. i can send you an off cut of body work to match against. Yes as long as it is not a metallic finish as the metallic colours we can offer in CombiColor are limited. Yes we can do this as long as it is not metallic or fluorescent shades. Send sample to: Rawlins Paints, Northspeed House, Moorview, Holbeck, Leeds, LS11 9NF for the attention of the Technical Department. Include your contact details and requirements. Dear Rawlings, I’m looking for a paint to cover two black garage doors that have been neglected for 25 years. There is no rust but the previous paint is flaking in places . Which paint would you recommend as a one-stop solution? Rust-Oleum CombiColor would be our recommendation for this. Assuming there are no areas of bare metal, thoroughly clean with something like Rust-Oleum Pre-Paint Cleaner and lightly sand if necessary to provide a key, then apply 2 coats of Rust-Oleum CombiColor in your chosen colour and finish. Two primers are available for use if required; Rust-Oleum 3369/3380 CombiPrimer Anti-Corrosion and Rust-Oleum 3302 CombiPrimer Adhesion. All colours for Rust-Oleum CombiColor can be seen by clicking 'Select a different colour' on the product page. Rust-Oleum CombiColor is available in almost any RAL, BS or NCS colour in Satin or Gloss finishes, including metallic shades but we only offer black and white in a matt finish and don't offer 'two tone' colours. Alternatively you may prefer to use Rust-Oleum CombiColor Wrought Iron as this has a pleasing matt, metallic black or green finish available. Hi... what is you nearest colour to the now discontinued Hammerite Grey (Direct to metal / hammered finish). Thanks in advance. We currently offer 5 different grey hammered finish colours across 3 different products - Rust-Oleum CombiColor Hammertone, Coo-Var Hammercote Hammered Finish and Rust-Oleum Universal All-Surface Paint (Brush - Hammered). Do you produce a mid- grey metallic combi-colour, gunmetal or similar ? RAL metallic shades are listed on this products colour options (click 'Select a different colour') - Greys include RAL 9006, 9007, 7048, 9022 and 9023. Unfortunately we are unable to mix Automotive colours in this product. We can however match colours if you are able to send us a sample of the colour you would like. Rust-Oleum CombiColor can be mixed to nearly all RAL, BS and NCS colours as well as custom colour matches. Can I paint over a metal surface previously painted with Rust-Oleum Universal All Surface Paint using CombiColor or will the two paints react with one another? Yes, Rust-Oleum CombiColor should be fine over fully cured Rust-Oleum Universal All Surface Paint. Ensure surfaces to paint are clean, well adhered and lightly sanded to provide a key. Yes we do, if you can provide an address we can post one out to you. Unfortunately not, but we do have a colour chart we can post out to you so you can have a better idea of the colours if you'd like to contact us with your address. Hi, I have a metal walkway leading into a residential property. It has been previously painted but the paint has warn off in some areas. Rust is also forming in some parts. I need something durable, that will prevent further rust and can be applied over the existing paint. Is this suitable? If not is there a product that is ? Rust-Oleum CombiColor would be ideally suited to this application as long as it is not applied to any areas that are walked on. Prepare thoroughly as per the product data (clean, remove all rust, flaking paint, etc.) then apply Rust-Oleum 3369/3380 CombiPrimer Anti-Corrosion to all areas of bare metal (assuming mild steel) and then to primed and previously painted areas (after cleaning and sanding to provide a key) apply 2 coats of Rust-Oleum CombiColor in your chosen colour and finish. Rust-Oleum 7500 Alkythane is available in clear and can be spray applied, this is similar to Rust-Oleum CombiColor and may meet your requirements. You can click 'Select a different colour' on the Rust-Oleum CombiColor product page on our website or you can provide us with an address and we can post a colour chart out to you. Rust-Oleum CombiColor can be mixed to nearly all RAL, BS and NCS colours as well as custom colour matches. Unfortunately we are unable to mix Automotive colours in this product. We can however match colours if you are able to send us a sample of the colour you would like. We believe the colour used most widely today is BS381C 539, we think pre 1968 the colour was BS381C 538. Rust-Oleum CombiColor is not an automotive paint range, however should you wish to test the application on to plastic bumpers we would recommend trying Rust-Oleum CombiColor Multi-Surface instead. Can rust-oleum combi colour original, for metal, be applied to bare timber please? No, we would instead recommend Rust-Oleum CombiColor Multi-Surface for bare timber. If I gave you some Pantone References would you be able to tell me the nearest match please? 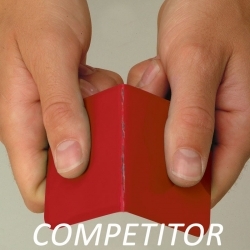 We would be able to mix and supply a 1lt of Rust-Oleum CombiColor in our nearest match for you test at the normal product cost, then if sufficient you could order what you require. What paint would you suggest to paint metal garage door which has previous black paint and undercoat? Rust-Oleum CombiColor would be ideal for these, assuming existing paints are well adhered and there are no bare areas, clean and abrade to provide a key and apply 2 coats of CombiColor to all areas. Rawlins Paints, Northspeed House, Moorview, Holbeck, Leeds, LS11 9NF. We can provide Rust-Oleum CombiColor in nearly all RAL, BS and NCS colours if you can find a colour suitable within these industry standard colour ranges. If not, then you can post us something showing the colour you require and we can formulate the closest match we can to it. Hi can I use the combi colour on a narrow boat above the waterline if so can I roller it over the existing paint and should I thin it ? Yes, sand intact coatings to roughen the surface slightly, the surface must be clean and dry during application. You can thin up to 10 vol. %; with Rust-Oleum 7301 CombiColor Thinner. Use short nap, polyamid (Perlon) 6-12mm rollers. Roller application may require 2 coats to achieve recommended dry film thickness. Can you offer combo colour paint in brown?? Yes, we can offer it in any RAL or BS colour if you click on the 'Select a different colour' link above underneath the price this will show you all colours and allow you to select which you would like. We also offer the full NCS colour range and many other colours not shown on the website which you can order by contacting us on 0113 2455450. As you have advised the galvanised steel is rusty, we would presume that the substrate is therefore very well aged, meaning that it is therefore possible to consider applying Rust-Oleum CombiColor directly. This should be done after degreasing the surface with a solution of Rust-Oleum Mathys ND14 Cleaner Degreaser, and after de-rusting of the affected areas. One coat is possible, although our best advice remains that application of a second coat will provide the benefits of better appearance and longer life expectancy. Can I paint this directly onto an old aluminium garage door without sanding or 1st. Sowing some rust on edges at bottom of door but otherwise sound just needs a clean look. No. The door should be thoroughly cleaned and the rusted areas should be abraded to remove all loose and flaking rust and spot primed with Rust-Oleum 3369/3380 CombiPrimer Anti-Corrosion. The rest of the door that is sound, after cleaning should be primed with Rust-Oleum 3302 CombiPrimer Adhesion and then overcoated with Rust-Oleum CombiColor in the finish and colour of your choice after 30 minutes. Can this paint be used directly on a previously coated shop front surface? Assuming the shop front is aluminium/powdercoat we would recommend using Rust-Oleum Pre-Paint Cleaner to prepare the surface then priming with Rust-Oleum 3302 CombiPrimer Adhesion and then finishing with Rust-Oleum CombiColor in the colour and finish of your choice. If the shop front has been previously painted with a conventional paint then after cleaning with Rust-Oleum Pre-Paint Cleaner, you can lightly abrade to provide a key and go straight on with CombiColor without the need for Rust-Oleum 3302 CombiPrimer Adhesion. Question: Going to sand blast a piece of agricultural machinery mild steel it will be exposed to fertilisers! What paint is best? Kongskilde red! Not sure on ral number? After blasting we would recommend applying Teamac Rapidry HB Zinc Phosphate Primer followed by Teamac Metalcote Plant Enamel. Unfortunately we have no reference of 'Kongskilde Red' so you would have to either choose the nearest RAL or BS colour or send us a sample to match. Question: I want to be sure Combi-colour paint will be OK to use on pre-painted and rubbed down aluminium patent glazing. While rubbing down, some areas are back to the bare surface. Will the primer/paint combined be enough? Can you advise me please before I start! Soundly adhered, well prepared previously painted areas can have the CombiColor applied directly. Any bare areas of aluminium must be first primed with Rust-Oleum 3302 CombiPrimer Adhesion. On powdercoat we normally recommend cleaning and first priming with 1 coat of Rust-Oleum 3302 CombiPrimer Adhesion. 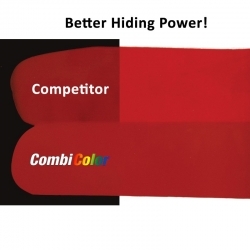 If you want to apply the CombiColor original to PVC you would need to first prime with Rust-Oleum 3302 CombiPrimer Adhesion. No, instead we would recommend you prime the wood with Zinsser Cover Stain followed by Zinsser AllCoat Exterior Gloss. The RAL and BS colours available in CombiColor are only available in Satin or Gloss finishes and in 1L or 2.5L sizes. If you require a matt finish in a RAL or BS colour, Zinsser AllCoat Exterior Matt may be suitable for your requirements. Although it is not what Rust-Oleum CombiColor was primarily designed for it is used for this type of application regularly. You will find numerous videos on YouTube of people doing similar projects by brush and roller. On bare ferrous metals Rust-Oleum 3369/3380 CombiPrimer Anti-Corrosion is always recommended to be used before application of the CombiColor. 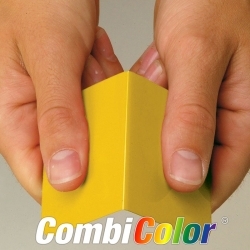 Question: Would the Combicolor be suitable for painting the outside of a narrowboat? If so, how many coats should we apply? 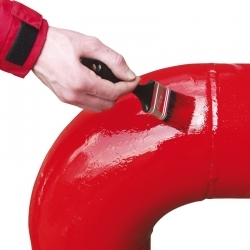 Yes, as long as suitable preparation is carried out and all areas painted are above the waterline. Apply 2 - 3 coats. We can't, but we can match to a physical colour sample (as long as it is not metallic) if you can post to our address below with your contact details? Question: We're looking to spray paint old cast iron rads (we're having them sandblasted first to clean off the old paint/rust). Can we use this product straight onto the cast iron? Do all the colours come in spray format/can, or do we need to adapt for use with pressure spray? Thanks. We would recommend applying Rust-Oleum 3369/3380 CombiPrimer Anti-Corrosion to the prepared cast iron surface before application of Rust-Oleum CombiColor. The primer is also available in an aerosol on the above link, Rust-Oleum CombiColor can be found in aerosols HERE. Question: what % paint to thinners do i use for rollering this product ? Add up to 10% (by volume) Rust-Oleum 7301 CombiColor Thinner. Use short nap, poly-amid (Perlon) 6-12mm rollers. Roller application may require 2 coats to achieve recommended dry film thickness. Question: Can this be used to repaint a fibreglass vehicle ? What sort or preparation would you recommend? Fibreglass should be cleaned and lightly sanded to provide a key, CombiColor can then be applied directly to the surface. If you encounter any adhesion problems or very hard/smooth surfaces you can always prime first with Rust-Oleum 3302 CombiPrimer Adhesion. Question: Can you use this directly onto galvanised steel? No, after appropriate cleaning of the galvanised surface you would need to prime with Rust-Oleum 3302 CombiPrimer Adhesion before applying Rust-Oleum CombiColor. We recommend you purchase 1lt of the matched colour to test the colour prior purchasing the full amount required as we cannot offer refunds on bespoke colours. Please ensure the colour sample you provide us with is good quality, we cannot match from pictures, material, letterheads, etc. Question: I need something to use on some internal steelwork. It's primed with a zinc undercoat already. Is the matt finish a suitable product for this? It certainly is but this product is only available in Black and White in a matt finish. If you would like to choose one of the other colours available you would have to take it in a Satin or Gloss finish. I am planning on using Rustoleum Combi Colour to repaint my van and was wondering whether it would also be suitable to repaint the plastic bumpers using the same paint? Yes it would but we would recommend priming any plastic first with Rust-Oleum 3302 CombiPrimer Adhesion. Would Rust-Oleum CombiColor be suitable to paint a previously painted metal garage door which is down to bare metal at the bottom where the original paint has started to flake off? Yes, ensure any loose and flaking paint is removed and the existing paint is sanded to provide a key for the CombiColor to stick to before painting. On the areas that are back to bare metal, although CombiColor can be applied directly to certain metals, garage doors are usually made from galvanised steel, aluminium, etc. which are difficult metals to stick to so we would recommend spot priming these areas first with Rust-Oleum 3302 CombiPrimer Adhesion. What is RAL, BS and NCS, and how much is it for a mixed product? RAL, BS and NCS are 3 colour ranges that are used throughout the industrial sector. Rust-Oleum CombiColor is available to order via our website in any RAL or BS colour, if you choose an NCS colour this can be purchased for no extra cost but the order would have to be taken over the phone. I'm wanting to touch up my white van with Rust-Oleum CombiColor. Unsure whether I need gloss or satin finish, and if the white will even match? I'm presuming the gloss finish will be more suitable but not sure how shiny the satin finish is? Although Rust-Oleum CombiColor will be suitable for touching your van up, there are many different variations of white and the standard white CombiColor comes in is unlikely to match your van. We can mix Rust-Oleum CombiColor to any RAL, BS or NCS colour, so we would suggest matching it to the nearest colour from one of these ranges and we can mix this for you in gloss or satin finish. As you have said, the finish on your van at the moment is most probably gloss, but for your reference the gloss level of the satin is 35-55%. Can I use Rust-Oleum CombiColor over a metal table previously painted with hammerite? Yes. Clean the surfaces down and lightly abrade with sandpaper to provide a key and then apply CombiColor directly to the painted surfaces in 1 or 2 coats as required.